In fall of 2011, BMW will introduce a 2012 3 Series Exclusive Edition that offer buyers new 18-inch lightweight V-Spoke wheels and a unique Mineral Grey exterior paint. Inside, Dakota leather is offered in either Pearl Grey with contrast stitching or black. To make the edition even more special and unique, Bamboo grain anthracite wood trim is included as well. In the performance department, the 2012 BMW 3 Series M Sport Edition gets an upgraded vehicle suspension, along with visual enhancements. The M Sport Edition features a set of 18-inch lightweight alloy wheels and shadow line window finishers join a body-color rear diffuser. At press time, it remains unknown if BMW will offer the two exclusive models for the US market. Stylish elegance or heart-pounding dynamics: Edition Exclusive and M Sport Edition packages for the BMW 3 Series Coupé and BMW 3 Series Convertible. The BMW 3 Series Coupé and BMW 3 Series Convertible will put an even more stylish foot forward in Edition Exclusive trim. A particularly eye-catching feature of this package are the 18-inch V-spoke light-alloy wheels painted in Space Grey. Customers can also select the exclusive exterior paint shade Mineral Grey as an option, or any one of the other colour variants offered as standard or as an option. Exterior mirror caps in Oxide Silver add further colour accents. Dakota leather upholstery has a defining influence on the interior ambience. The seats can be ordered in the exclusive colour Pearl Grey with grey contrast stitching, or in Black with white contrast stitching. Floor mats with colour-coordinated piping make the perfect complement. And finally, Edition Exclusive specification also includes interior trim strips in Bamboo Grain Anthracite. M Sport Edition adds another layer to the athletic capability of the BMW 3 Series Coupé and BMW 3 Series Convertible. M Sport suspension joins forces with other interior and exterior equipment features to inject even greater intensity into the dynamic driving experience. The exclusive Silverstone paint finish familiar from the BMW M3 and 18-inch Ferric Grey light-alloy wheels in double-spoke design lend the car’s sporting credentials visual impact. Also playing their part in refining the car’s exclusive appearance are the BMW Individual High Gloss Shadow Line window recess finishers and the black-painted exterior mirrors. The rear apron with integrated sports diffuser painted in body colour, which further optimises the car’s aerodynamic properties, provides an additional sporting touch. 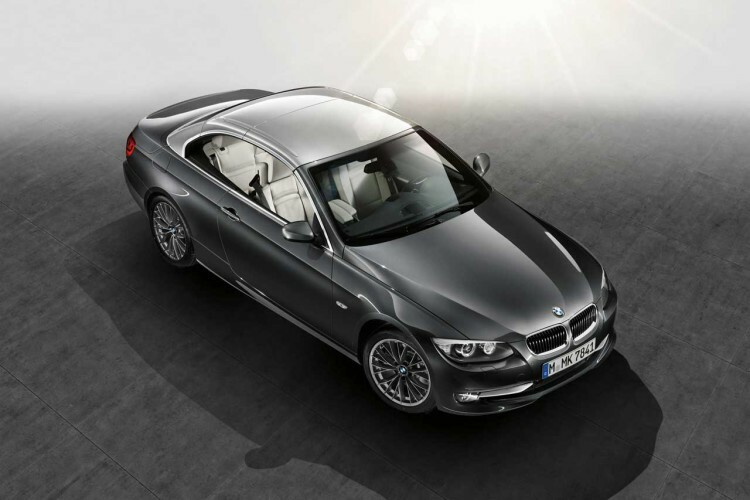 The BMW 3 Series Coupé can also be specified with an M rear spoiler as an option. 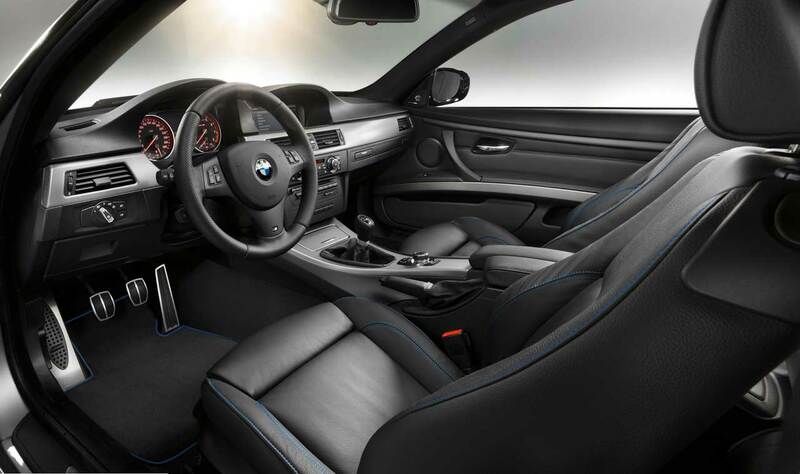 Inside the car, sports seats with M detailing, an M Sport steering wheel, stainless steel pedals and an M aluminium driver’s footrest point to the exclusiveness of the Edition model. Dakota leather seat covers with blue contrast stitching and special “M” piping are also included. Model-specific interior strips in Aluminium Glacier Silver dark and floor mats with blue piping set the seal on the M Sport Edition package.